Triple Rainbow 7s Classic Slot Guide & Review - Casino Answers! Triple Rainbow 7s is a 3-reel, 1-line classic slot machine, featuring a wild symbol and multipliers. 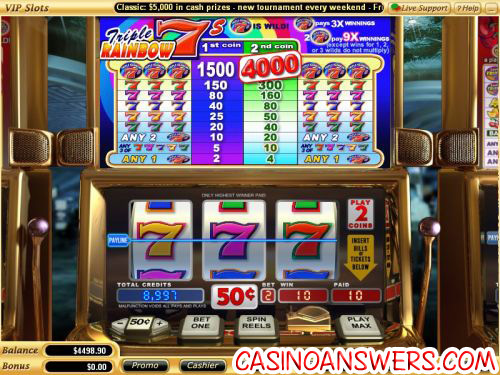 You can play the Triple Rainbow 7s at US-friendly casinos Caribbean Gold Casino and Online Vegas Casino. The Triple Rainbow 7s symbol is the highest paying symbol on the Triple Rainbow 7s slot machine. 3 Triple Rainbow 7s symbols on the payline will pay out 4000 coins on a max bet spin. The Triple Rainbow 7s symbol is wild and will substitute for all symbols in the slot game. It will also pay 3X your winnings with one symbol or 9X with two symbols. To use the Triple Rainbow 7s symbol to win big on this classic slot machine, sign up now at Caribbean Gold Casino! There are 9 winning combinations on the Triple Rainbow 7s slot machine. The full payout schedule is as follows (1/2 coin payouts in parenthesis): 1 Triple Rainbow 7s symbol (2/4), any 3 7s symbols (5/10), 2 Triple Rainbow 7s symbols (10/20), 3 Green Seven symbols (20/40), 3 Yellow Seven Symbols (25/50), 3 Blue Seven symbols (40/80), 3 Pink Seven symbols (80/160), 3 Red Seven symbols (150/300) and 3 Triple Rainbow 7s symbols (1500/4000). Triple Rainbow 7s offers a good 4000 coin top jackpot and some sweet multipliers that you can hopefully turn into some big cash wins. To play the Triple Rainbow 7s classic slot machine, sign up and make a deposit today at Caribbean Gold Casino! Are players from the United States able to play Triple Rainbow 7s for real money? American players are welcome to sign up and deposit at Caribbean Gold Casino and Online Vegas Casino, where they can find Triple Rainbow 7s and well over 100 casino games. Can I play a free Flash game of Triple Rainbow 7s? While Triple Rainbow 7s is not offered at Caribbean Gold Flash Casino and Online Vegas Flash Casino, they have many other classic slots and video slots you can play. If you experience issues with the Instant Play casino, try downloading the latest version of Adobe Flash Player. Is there a progressive jackpot on the Triple Rainbow 7s slot machine? There is no Triple Rainbow 7s progressive jackpot. If you’re looking for a Vegas Tech progressive jackpot slot, you can read our Mega Money Mine Progressive Jackpot Slot Review, Pay Dirt Progressive Jackpot Slot Review, Red, White & Win Progressive Jackpot Slot Review. Where to play the Triple Rainbow Slot Flash Game?